London is a city like no other, an exciting combination of bustling atmosphere and traditional charm. 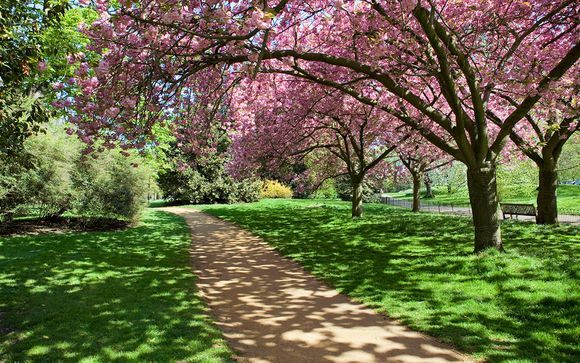 The city is home to many large parks and green areas, none more famous than nearby Hyde Park. Take a walk around the historic landscapes including Princess Diana Memorial fountain, or hire a rowing boat on the Serpentine. Wander through the park to Kensington Palace, where you can take a tour and explore the gardens or visit the royal home Buckingham Palace. London’s biggest shopping district, Oxford Street, is mere moments away, the hotel is only 0.2 miles away from Marble Arch station (on Oxford street) or 0.4 miles from Bond street Station, and features many flagship stores. Visit the iconic luxury department stores Selfridges and Harrods, just a 20 minute walk or a few tube stops away. Catch a musical in the West End theatre district or enjoy the vibrant social scene of Soho, Covent Garden and Piccadilly Circus. Go to an exhibition or event at one of London’s famous arenas like the Royal Albert Hall, Olympia, Earl’s Court or the O2. Designed by RDD Interior Architectural Design, The Arch London was inspired by the London landmark, Marble Arch, and the local neighbourhood. It spans seven Grade II listed townhouses and two mews homes. Vibrant installations of commissioned art by emerging British artists can be found throughout the hotel, punctuating the formal spaces created by the glorious Georgian architecture. 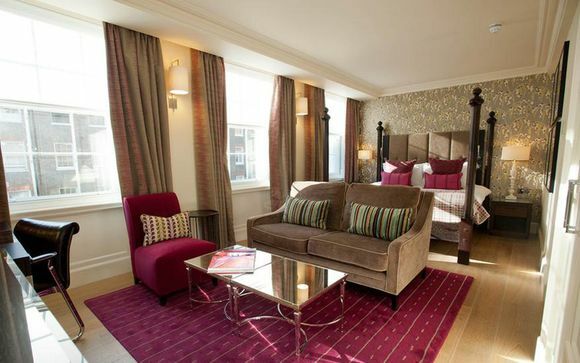 The 82 guestrooms and suites also showcase pieces alongside ten individually designed colour schemes. Intricately finished, the materials used within this remarkable building have been chosen for their aesthetics, as well as ability to emphasize the immaculately restored classic features. Each suite is individually decorated with plush fabrics, hand printed wallpapers and tasteful colours to ensure guests can retreat to their luxury accommodation and recline in sumptuous surroundings. Technology combines with the rich designs and artwork to give a boutique feel, but with all the comforts of home. The luxurious large bathrooms are equally impressive with exclusive Malin+Goetz products, stunning black granite and mirrored finishes, revitalising rain showers, state-of-the-art flat screen televisions in the bathroom and bath pillows for a truly indulgent bathing experience. Le Salon de Champagne - Le Salon de Champagne is a stylish area within HUNter486 with a unique arty ambience. Perfectfor a glass of Champagne before dinner or a sumptuous location to meet friends and family for drinks close to all the nightlife of Bond Street - it's laid-back luxury at its best. Guests will enjoy the social vibe as much as the fine choice of fizz and flawless personal service. The Bar - The Bar at The Arch London is a fantastic place for drinks close to all the fashionable nightlife and exclusive shops of Bond Street and within a short stroll of Hyde Park. Afternoon Tea in the Library - Relax and enjoy Afternoon Tea in the Martini Library, a fabulously decadent space offering a chance to unwind in the heart of London. With its opulent armchairs, period stone fireplaces, and intriguing collection of Taschen and Daunt books celebrating the magical golden age of Broadway, this is a luxurious experience to enjoy. The Gym - Work out in the convenience of The Arch London’s innovative gym, available exclusively to guests, 24-hours a day. Situated on the lower ground floor with a glorious vaulted ceiling, it features the latest fitness equipment by wellness experts Technogym, from treadmills and cross trainers, to rowers and weights. The gym also features an area for stetching and Power Plate equipment complete the offering.